The Cleveland Browns finished their 2017 campaign with the lowest attendance averages experienced since the early 80s, but that is all behind them now. The 0-16 crusade is a thing of the past and the Baker Mayfield era has arrived in northeast Ohio. All eyes will be on the quarterback situation in Cleveland. Mayfield, the recent No. 1 overall pick and Oklahoma standout, will compete with a veteran in the dual-threat quarterback Tyrod Taylor. 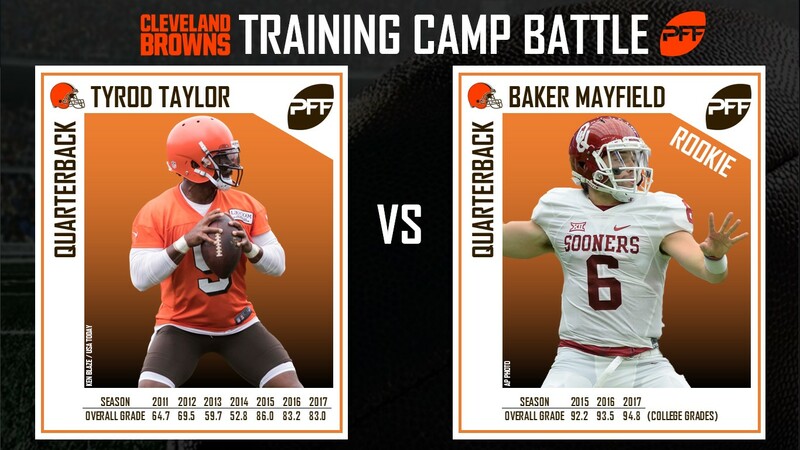 Taylor has been named the team’s starter by third-year head coach Hue Jackson, but not without Mayfield competing for the job. During Mayfield’s 2017 season, he had a passer rating outside the pocket of 139.6, two spots ahead of Louisville’s Lamar Jackson, showcasing his ability to navigate outside the pocket while being calm enough to operate downfield. There will be ghosts of Cleveland past in the minds of Browns fans, but they may not want to bet against Mayfield. He led all NCAA quarterbacks in 2017 in deep pass adjusted completion percentage (60.3 percent), passer rating on play action (154.3) and non-play action (115.8), as well as overall adjusted completion percentage (80.6 percent). Mayfield has been proving doubters wrong his entire career, and now he takes it to the biggest stage. The Browns’ front office set the quarterback up to succeed based on the weapons put in place that surround the position. Second-round pick Nick Chubb finished his 2017 campaign with 56 forced missed tackles, third among draft-eligible running backs. Carlos Hyde was one of the team’s early offseason additions on March 16th and will be the veteran back among Chubb and Duke Johnson. 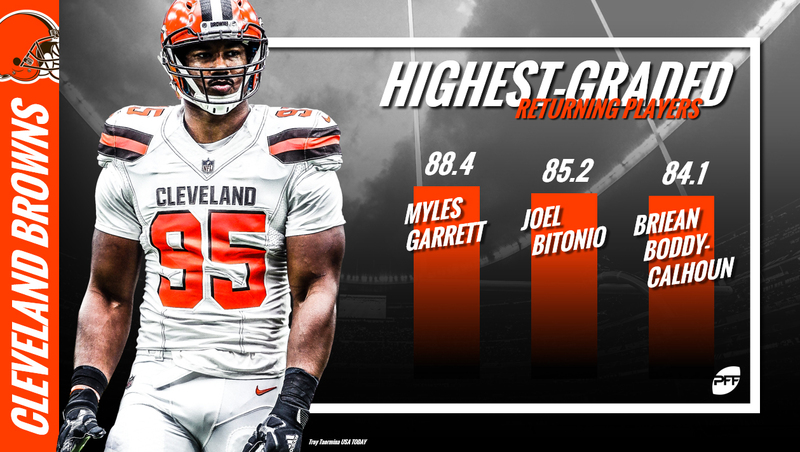 Johnson earned a very respectable 81.7 overall grade last season. Jarvis Landry was a their big-ticket signing this free agency and will be the focal point of their passing attack alongside Josh Gordon, Corey Coleman and David Njoku. The former Dolphin led the league in slot receptions with 68 in 2017. It is not every year a future Hall of Fame left tackle retires from the franchise. Joe Thomas earned a PFF grade of 86.0-plus in every season of his 11-year career. Thomas, the second-highest rated pass-blocking left tackle last season (88.4, behind David Bakhtiari), has left the Browns, which leaves 465 snaps unaccounted for last season and 11,000plus over his career. Third-year offensive lineman Shon Coleman will likely enter training camp in Thomas’ spot, but there is a group behind him waiting to compete. Second-round pick Austin Corbett, who ranked 13th in the 2018 NFL Draft class in pass-blocking efficiency (98.0), will push for play time, as well as undrafted free agent Desmond Harrison. Greg Robinson and Joel Bitonio are also available to be slotted in for action if need be. There is a plethora of new players at this position, but that is consistent across the whole team. John Dorsey, in his first offseason with Cleveland as general manager, carefully pieced together the Browns’ new-look secondary. Damarious Randall is expected to return to safety where he played 73 percent of his snaps during his senior year of college, but less than six percent the last three NFL seasons. E.J. Gaines and Terrance Mitchell enter from the Buffalo Bills and Kansas City Chiefs, respectively. The secondary will be capped off by Denzel Ward, the fourth overall pick in the last year’s draft. Over the last three college seasons, Ward ranked fifth in targets intercepted or defensed and ninth in yards per target. The Cleveland Browns brought in nine players from the draft, along with a dozen more in free agency. New faces are good in a situation where things can only get better. Fans will get their first look at those new faces when they open training camp in Berea. How long before Mayfield loosens Taylor’s grip on the quarterback position?